If you're into hiking, you can’t miss the incredible hike from Theth to Valbona! It’s a beautiful and challenging route which starts in the mountain village of Theth and heads over a mountain pass and into Valbona National Park. 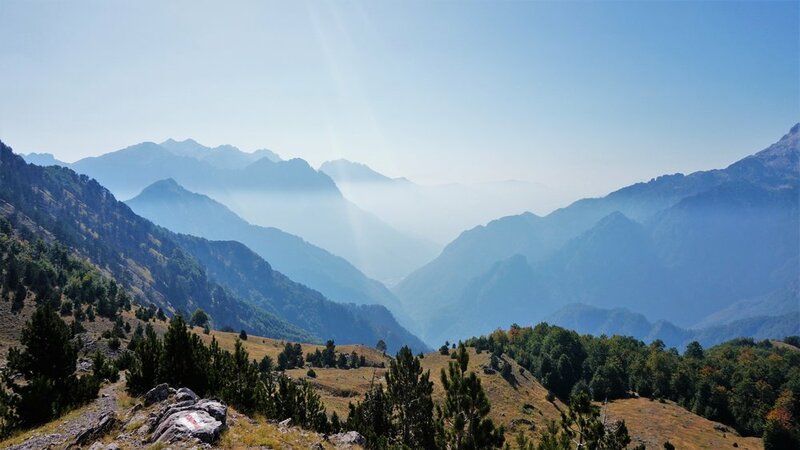 Most travellers will begin their journey in the nearest city, Shkoder, and the journey from Shkoder to Valbona (or in reverse) makes for a great few days of adventures, small mountain villages and epic views. While hiking from Theth to Valbona is a common route, information online and in the area varies greatly and prices, distances and experiences seem to change daily. So here are our experiences and tips getting from Shkoder to Valbona and back including a taxi from Shkoder to Theth, hiking Theth to Valbona and taking the ferry on the Komani Lake back to Shkoder. Shkoder is a great base for this area and we found the perfect campground (also a hostel)to relax before and after our adventure -complete with luxury pool, hot showers and a restaurant. For more things to see and do in and around Shkoder read our Shkoder City Guide. We weren't sure about taking our van to Theth and in the end decided against it after hearing some stories about the road. We also decided on a round trip to Shkoder so we left the van there. The owner of our campground organised a 4-wheel-drive to Theth for €10 per person. Most accommodation should be able to organise this but if not, just outside of Shkoder on the way to Theth all of the 4x4s hang out waiting to be filled so you can head there. The drive is about three hours and is asphalt for the first half. After that it’s winding gravel roads that our van would have made it along but not been so happy about, he's done more than his far share of crappy Balkan roads! The 4x4s leave early so you should arrive in Theth around 11am with some time to relax or explore. We got dropped a little before Theth to hike to the Blue Eye. We were dropped here and we hiked down a very steep path to the Blue Eye, this took around two hours. Our driver took our bags on to our guesthouse in Theth. We then took the path back to Theth which is around 30 minutes of narrow track and then a further two hours along a gravel road. This was far less challenging than the way there although the gravel path is not sheltered at all so it was a very hot walk! I would recommend just driving all the way to Theth and walking to the Blue Eye and back from there. The Blue Eye is beautiful and makes a nice day hike but we ended up being very tired and having sore legs the next day for the main hike to Valbona. There are 4x4s that can take you most of the way from Theth to the Blue Eye so if you’re not super fit or don’t feel like an extra day hiking this could be a good option. We stayed at Guest House Gjergy Harusha (not online) which provided great food (dinner and breakfast) and a super comfortable ensuite room for €20 per person per night. It even had WiFi! If you want to book in advance, we’ve heard good things about Gjin Thana or check out other accommodation options in Theth here. So after a filling breakfast, we began the hike to Valbona. We started around 8am to beat the heat of the day and give ourselves time for some stops. We travelled as a group of 5 of different fitness levels and completed the Theth-Valbona hike in nine hours including at least two hours of stopping. We heard stories of anywhere from 5-10 hours depending on pace but I recommend planning around 6-7 hours of walking plus stops. And you'll want to stop and enjoy the views! We did the hike without a guide and found the trail easy to follow. It may help to have Maps.me with you to make sure you're heading in the right direction but there are markings and you'll also meet other hikers along the way. The hike from Theth to Valbona takes you to the top of a mountain and back down the other side. A lot of the way is steep and gravelly but there are also some flatter parts. There are four cafes along the way, two on the Theth side and two closer to Valbona. All of the cafes have water springs so bring a reuseable water bottle. There is quite a long way between café 2 and 3 including a stop at the peak. So make sure you have enough food and water. The views from the top are well and truly worth it. Leave your bag at the turn in the path and walk the extra couple of minutes of uphill to see the amazing panoramas over the valley on either side. From the top it is an easy 50 minute descent to the next café to fill up water and rest for a while. The final stages involve some steep downhill followed by a few kilometres along a dry, stoney riverbed to the town of Valbona. There are guest houses located along the main road but we had booked Hotel Margjeka which was thankfully the first accommodation we came to. We did the hike in running shoes but some parts were very slippery and the next day there was rain so if you have space get yourself some proper hiking shoes. We also carried our backpacks of between 20-50L. We bought tickets for the boat back at our campground in Shkoder but I'm sure they are easy to organise from Valbona. We paid €15 per person for the entire way including taxis. A taxi collects you from your hotel in Valbona, ours was a little late so we ended up racing along past herds of cows and sheep to the port in Fierze. The ferry from Fierze to Koman is a beautiful journey along the Komani Lake. It takes around three hours and you'll be entertained by stunning scenery on all sides. It can get quite chilly so take a jacket! Our merino wool hoodies kept us cosy and oh so stylish! From the boat we were met by a minibus which took us the last hour and half from Koman to Shkoder and dropped us at our campground to find our van safe and sound. The hike from Theth to Valbona is one the of the best hikes we've done and I thoroughly recommend it to anyone on a trip through the Balkans. Taking the ferry is a great way to relax and enjoy some brilliant views on the way back. This trip is also possible in reverse if you're coming from another part of the country or simply prefer to mix things up! This guide has everything you need to know about things to do in Tirana, Albania. Including the best restaurants in Tirana, where to stay in Tirana and all the best Tirana attractions with helpful tips. A complete guide for things to do in Shkoder, North Albania. Includes recommendations for places to stay and eat as well as things to see in Shkoder and day trips around Northern Albania.